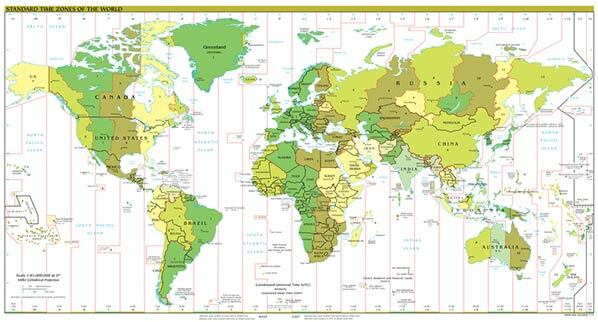 World time zones are listed below according to time zones' standard time. During example locations' daylight saving time these time zones are off by one hour. Example times and dates are according to ISO 8601 notation. One time zone is 15 degrees longitude and there are 24 of them. A full circle, 360 degrees, divided by 24 as the number of hours in a day results 15 degrees. The time difference between two time zones next to each other in the 24 hour system is one hour. A few countries do not follow a time zone according to their physical location. They may have chosen another time zone that is more purposeful related to their current politics, business partners or just for the ease of use. One of the 'ease of use' examples is China which follows one time zone in a land area that crosses five time zones. Altogether there are 40 time zones that are offsets from Coordinated Universal Time (UTC) by a whole number of hours from UTC-12 to UTC+14 or which are offsets of 30 or 45 minutes. Some countries use daylight saving time (DST) during the summer months to move the first light hour from the morning to the afternoon. This method saves energy by reducing the need for artificial lighting and increases a possibility for outdoor activities in the afternoons since the sun sets an hour later.